May | 2016 | PlugInCaroo… Karo plugin… abhi!… save the environment!!! CNG Scorpio… the best car ever! The dilemma of buying an SUV in India today is HUGE as diesel cars are a very polluting lot and because of that they are getting banned in quite a lot of cities. Because of the ban M&M is looking forward to introduce the Scoprio with a 2.2L petrol engine into the Indian market which is at present exported to many countries. Actually Mahindra can retrofit these petrol Scorpios with CNG kits and it will be more actractive than even the Diesel Scorpio due to the low fuel expense and low maintenance cost. But to beat the companies the customer must buy Petrol SUVs and convert them to CNG. This is actually very profitable for the people as Petrol is 60% more expensive than CNG as on 2016 CNG = Rs 41 and petrol = Rs 66 in Mumbai. Not only that buy CNG gives better mileage than petrol and there is absolutely no loss of “power”. The beauty with CNG is that you can have a car at the cost of a bike. But do note that converting to CNG would void your car warranty. But who cares when you can save around Rs 20,000 per year in fuel costs!!! So instead of buying a tiny unsafe subcompact car it makes great sense to buy a petrol Scorpio and convert it to CNG after the first 1,000 (just in case if the car has some tiny problems its better to test it for 1000 kms). Why Is Natural Gas a Good Source of Fuel for Survival Vehicles? Commercially available natural gas includes 70 – 90% methane. Since methane is made from the decomposition of organic matter in the absence of oxygen, it is actually very easy to make even at home from kitchen and toilet waste (biogas). (Can you even believe it you will be driving a car fuel of which you can make at home!). But PLEASE AVOID USING LPG OR COOKING GAS as it is very dangerous and thus illegal!!! Even though you may only get 50 – 80% methane in a home based methane generator, it is still enough to power vehicles and just about anything else in your survival location. Therefore, even if petroleum based products become unavailable, you will still be able to run farm equipment converted to natural gas and other essentials for making a living without relying on the current society. This entry was posted in Uncategorized and tagged 2.2L Petrol, 2.2L Scorpio, 2.2L Scorpio Petrol, Biogas, Compressed Natural Gas, Conversion to CNG, Mahindra Scorpio, Natural Gas, Petrol Scorpio, Petrol To CNG, Scorpio, Scorpio Petrol on May 31, 2016 by PlugInCaroo. There are several issues linked to pollution caused by diesel vehicles . Is the government planning to discourage diesel use? This entry was posted in Uncategorized on May 29, 2016 by PlugInCaroo. This entry was posted in Uncategorized and tagged 2x2, Cargo Bike, cargo electric bike, Cargo Motorcycle, electric cargo bike, electric cargo motorcycle, UBCO on May 23, 2016 by PlugInCaroo. Ather Energy has a chance to dominate the world tractor market… bigger and wider wheels are paramount… it can completely capture Mahindra Tractor sales… whether Ather prefers to do this is completely up to them…. 70% of India resides in villages and of that 90 percent of Indian farms are small holding between 1 to 5 acres. It is expensive for a farmer to hire tractor and transport services frequently not only for ploughing his field… but also to transport his goods to the nearby market… and also to use as a work horse on the farm…. like carrying stuff like saplings or harvest to and from house, etc. Actually the existing electric rickshaw can be modified a little by adding bigger and wider wheel on the rear and the front. This vehicle can be a rickshaw and also double up as a tractor when needed. 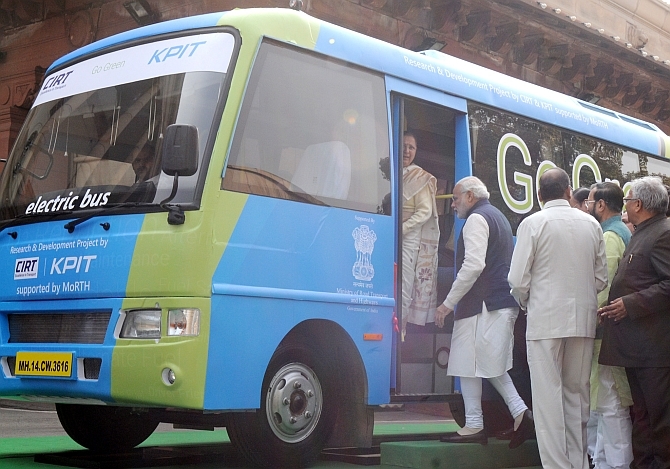 Since the vehicle will be under the sun providing solar panels to dc-recharge the batteries would be a boon too. The vehicle could have Li-Ion or Lead Acid batteries…. Its sad that Enfield has chosen to ignore this huge market…. the problem with Indian market is that there is so much profit in any sector that there is no need to even innovate… just keep doing the same thing… The bullet has more or less remained the same until the last few years, Bajaj kept making auto rickshaws for so many years… but never thought of making a trike or an ATV buggy… and TVS bikes have been similar from ages…. the Nano has been the only vehicle to undergo so many changes… but even there you dont see the open top convertible Nano…. or the muscle Nano. Now even the Nano has reached a comfortable stage after GenX from where it will stay almost boringly unchanged for another decade…. the classic example is the Ambassador and Padmini… never changed its shape… neither its boot… not its hood. This entry was posted in Uncategorized and tagged Bullet, Bullet Santi, electric tractor, Enfield Bullet, Farming, farming with electric bike, Farming with Motorcycle, ploughing with motorcycle, Tractor on May 22, 2016 by PlugInCaroo. With an average of 300 sunny days a year, ample rooftop space and push from Modi Government, India is witnessing a solar boom. According to Kunwer Sachdev, Su-Kam’s Managing Director, in the coming 5 years there will be a solar revolution in India – like mobile phone revolution. We are a country of billion plus people if something catches on it is bound to be BIG! This entry was posted in Uncategorized on May 17, 2016 by PlugInCaroo. Su-Kam is proud of its distributers and with the growing installations of solar power plants happening around the country we are blessed to have increasing number of loyal distributers who are dedicated to sell solar products. Punjab is a state in India with a population of 27 million people, and an abundant amount of sunlight falling on its surface with a rough estimate of 2762 hours annually. That being a massive amount, the people of Punjab are not shying away from utilizing free solar energy to run their household load. This entry was posted in Uncategorized and tagged E-rickshaw, ek nayi soch, Electric Rickshaw, Kapil Dev, Kapurthala, Moga, Mohali, Punjab, Sailapur, Solar Electric Rickshaw, Solar Rickshaw, Su-Kam, Sukam, www.sukam-solar.com, www.sukam.com on May 17, 2016 by PlugInCaroo. From childhood we are being taught to Save Tap Water… but nobody has taught us in school how to save rain water. Nothing has been done to save rain water when it should have been the other way around. The ability to save tap water pales in comparison the sheer quantity of rainwater that is wasted into the sea through storm drain pipes. The ratio if there was any would be in the ratio of (1:23) 1 liter of tap water USED every day we have ignored 23 liters of rain water EVERY DAY. The truth is India gets so much of rain… (whenever it rains)… that we no longer care to save rain water. So it just flows into the sea. Then there are periods of acute water shortage… this is also true in India’s Cherapunji which receives the highest rainfall in the WORLD. We have in fact forgotten how to build step tanks in proportion to the population growth. Just like we forgot the principles of farming by 200 yrs of British rule we have also forgotten the importance our forefathers gave for ponds and water harvesting features. In farms people are covering and filling ponds for better agriculture output. 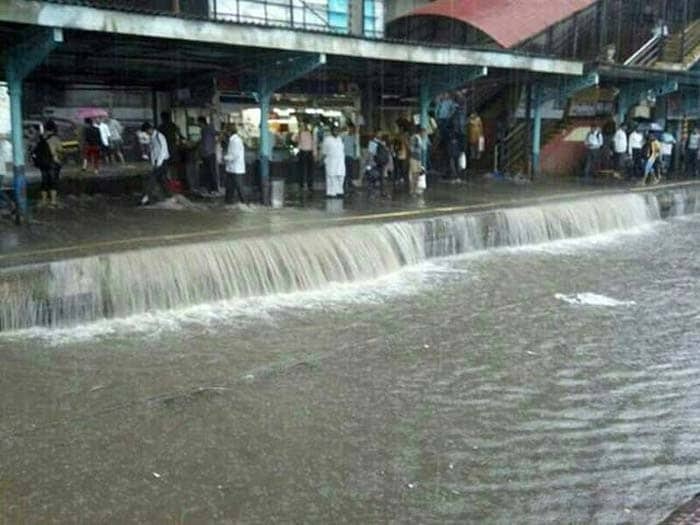 So how much rain water can we collect with a 1,000 sqft (3BHK) house roof in Mumbai? The answer is 192,780Lts per day. Or 1773, 50,200 Liters in 3 months of rain. (17 million ltrs or 1.7 Crore ltrs of rain in 3 months). How did we arrive at this figure? How much rain water can 1000 sqft roof of house save? Answer = 600 gallons or 2268 ltrs! Since 1,000 sqft can save 600 gallons as per the above link if we get 85 inches of rain in one day we get about 600gallons x 85 inch = 51000Gallons of rain water DAILY. 51,000Gallons x 3.78 = 192,780 Ltrs Daily!!! Now if we divide the total amount of rain water collected in the year by 365 days we get 17350200/365 = 47,534 Ltrs per day!!! Most people get about 2,000 ltrs of tap water for daily use in their house ceiling tank. Now if you waste your complete tap water daily you can waste only a maximum of 2,000ltrs daily while at the very same time you waste 47,534 ltrs (1,73,50,200/365) of rain water daily. This is a ratio of about 2: 47 or 1:23. But are not our city buildings are committed to saving water by holding them in Cement Tanks & Sintex water tanks in the basement of the buildings. NO this is not water harvesting this is water storing and do not refill the groundwater. The capacity of any and all manmade tanks are limited and just a fraction of the size of chambers that nature has made in the belly of the earth… that too not far from the surface. The man made tanks cannot create rivers or increase water table. Lack of Water Harvesting into Ground leads to Flooding. On one hand wells and tubewells are running dry on other hands water is flooding the topsoil. So why is no rain water being channeled into wells and borewells to store water and refill the ground water table. These wells are actually openings to huge underground tanks which nature has prepared over the years. Tanka Water Harvesting Design – Water can be channeled from the roof of the house to your existing well or bore-well. What happens when you don’t do not store water underground? The Earth punishes you for being foolish! The unsaved rain water starts flooding the streets, goes into the gutters and drainage pipes, sewage drainage systems, storm drain pipe lines and when 1 million homes let this water waste you can multiply 47,534 ltrs x million. This will create flood… massive flood especially if the tide is high and the storm drain pipes cannot empty the water into the sea. Previously earthworms and dung beetle were taking away a lot of pressure and creating their own tunnels for the water to flood and refill the groundwater but now with the advent of chemical fertilizer and pesticide and concrete/tar roads the water do not enter the earth but flows from the top into surface water drains. So next time somebody tells you to save tap water… ask them if they are saving rain water? This entry was posted in Uncategorized and tagged borewell, save rain water, save water, save water to well, waste tap water but save rain water, water harvesting on May 16, 2016 by PlugInCaroo.